A pair of ospreys have been reunited at the Loch of Lowes wildlife reserve near Dunkeld in Perthshire for their fifth season together. 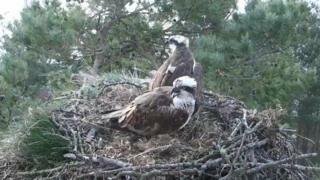 The female osprey, Lassie, arrived at the reserve at 17:47 on Saturday. Her mate had arrived eight days earlier. Scottish Wildlife Trust staff said the male bird brought his partner a fish within half an hour of her landing. The pair have successfully fledged 10 chicks from 12 eggs since they began breeding in Perthshire in 2015. Lassie is also known by the designation LF15 while the male bird is LM12. Sara Rasmussen, the trust's Perthshire ranger, said: "It's exciting to see our resident birds back together. Ospreys live completely independent lives outside of the breeding season but LM12 and LF15 have quickly re-established themselves as a pair. "They have already made their first attempts at breeding. LF15 will begin laying eggs about ten days after the first successful mating. Ospreys have been brought back from extinction in the UK and there are believed to be more than 200 pairs breeding each summer.